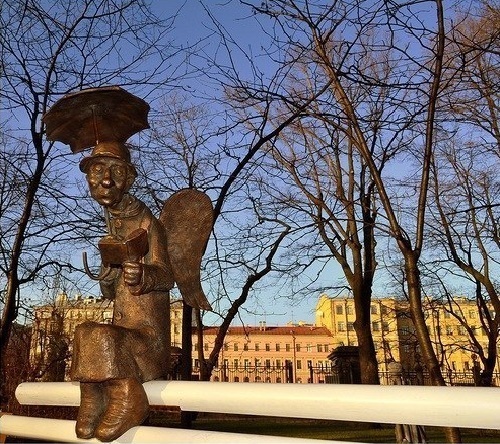 Saint Petersburg Bronze Angel settled on a bench in Izmailovo park. 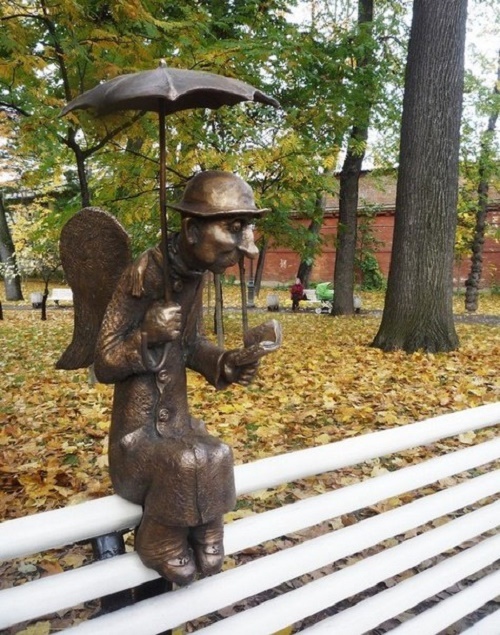 He hides under an umbrella and reads a book – a real Petersburg resident – intellectual. Angel gives a good mood and fresh thinking to all those who sit down next to him on the bench. Izmailovo is a beautiful garden in St. Petersburg – with quiet alleys, maple trees, and cozy benches. It makes you want to sit down on one of them and read an interesting book. However, on the same bench the reader is already sitting. 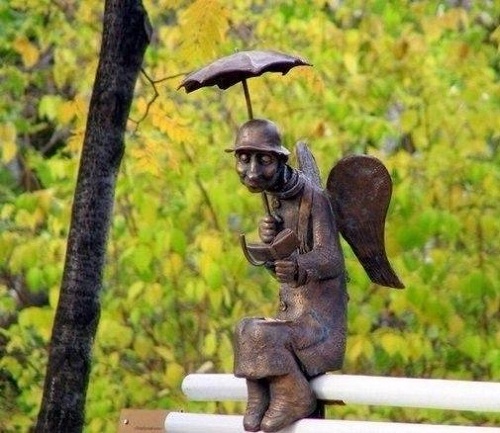 So called “Petersburg Angel” – sculpture, which appeared in the Izmailovo Park October 12, 2012. 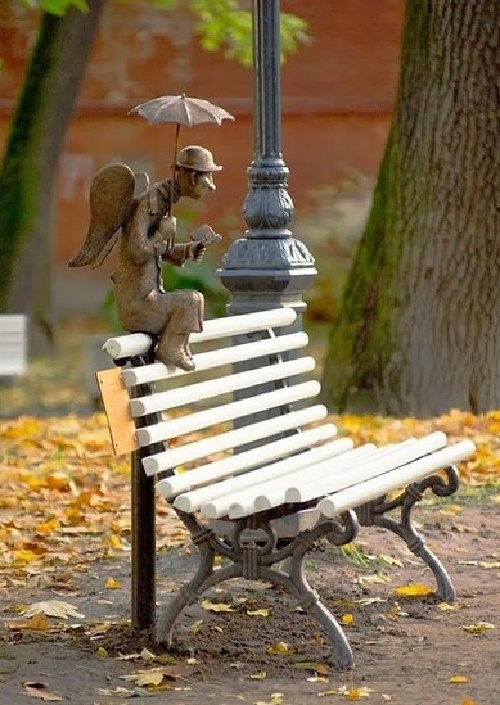 A small bronze angel in long-skirted rumpled coat and funny old-fashioned hat perched on the bench back. From the rain, he is hidden under the umbrella and carefully reads his wise book. 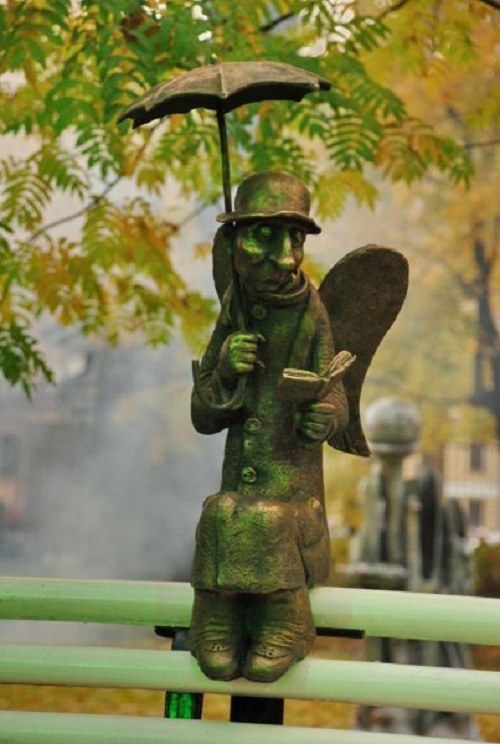 The author of the bronze sculpture is the famous St. Petersburg artist Roman Shustrov. By the way, he is the creator of a huge number of decorative dolls. The sculpture was created for the Symposium on Urban sculpture, organized by the Urban Planning and Architecture Committee in 2012. Although it was the first experience of the artist with a bronze, it was a success. In addition, “Petersburg Angel” became one of the five winners at the symposium. 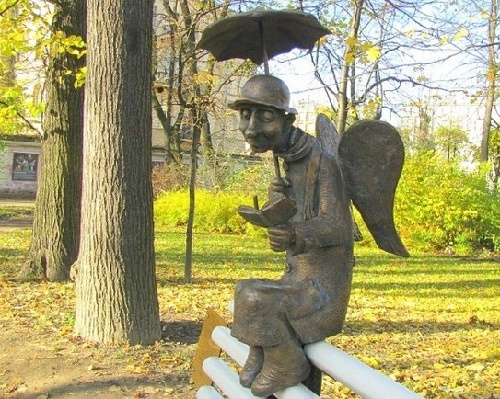 Touching and soulful 70-cm angel with big kind eyes meet visitors in the Izmailovo Park on Fontanka, near the Youth Theatre. Citizens and tourists use to put a coin on the lap of the angel – for good luck. Besides, the angel is a reminder of charity, on which the human society is based.